For numerous Filipino families, it is tradition that the oldest child will pursue a career in medicine. Which is exactly what Suprema Picardal Stewart did, not realizing where her pursuit would lead her. Emma was born in Nueva Ecija province, north of Manila, the oldest of six children, to Conchita and Luciano Picardal. Following custom, Emma enrolled in medical studies at Santo Tomas, the oldest Catholic University in the Philippines, run by Dominican priests. Among the 400 students in her class was a young behavioral science graduate, Southern California native James Stewart, who was continuing his medical studies. Before long, the two were dating, and one week after graduating, they were married and soon after left for the United States. Returning to sunny California, the couple settled in San Gabriel where Jim and his physician-brother John opened Stewart Medical Group in Alhambra. “Their family doctor owned the building,” says Emma, “and there was a verbal agreement that one day Jim and John would take over the practice.” Emma assisted in the office, working there for 16 years. By this time, she and Jim were raising their three children: Karen, Christopher and Kimberly, all of whom attended Saints Felicitas and Perpetua School, with the girls then advancing to Flintridge Sacred Heart Academy and Chris to Loyola High School. Emma started her service at their parish of 30 years, Saints Felicitas and Perpetua Church in San Marino. 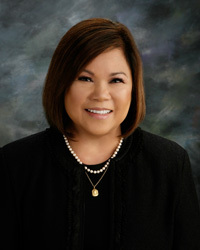 She was on the Parish Financial Council and currently the Women’s Association and the Filipino Association. She is a Lady of the Equestrian Order of the Holy Sepulchre, organizing First Monday Rosaries. She has been President of the Auxiliary of the Pregnancy Help Center of San Gabriel Valley. The Auxiliary helps to raise funds for the Center so it may continue to support crisis pregnancy and its pro-life mission. She currently serves on the boards of Christ Child Society of Pasadena, Legatus Pasadena Chapter and the Carmelite Sisters of the Most Sacred Heart of Los Angeles, for whom she has served on the board of Sacred Heart Retreat House and assists with the Sisters’ annual “Luck of the Irish,” St. Patrick’s Day fundraiser. Some of Emma’s most gratifying service is with the Good Shepherd Shelter in Los Angeles and connecting with the center’s clients – mothers who have been abused. Emma is among a dozen or so volunteers who, each month, take these mothers on outings while their children attend school. She takes great joy in the accomplishments of all of her children. Son Christopher attended USC, studied art at Pasadena Art Center under Professor Christopher Slatoff, whose bronze sculptures can be seen throughout Southern California, and is now his assistant. Daughter Kimberly attended New York University and has put her culinary skills to work as general manager for a local gourmet marketplace and catering company, Gelsinger’s Amber Road in Montrose. Emma and Jim enjoy traveling, having spent many family vacations on numerous trips abroad. And when the kids were young, taking motor home trips in the summers. She is trying to learn golf (“Jim loves it”), and loves gardening.